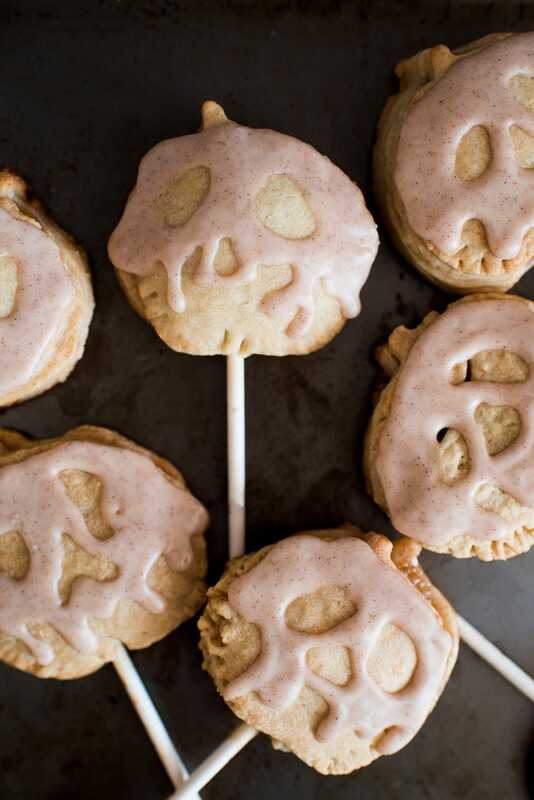 These Snow White Poison Apple Pie Pops will have you feeling positively villainous. And they’re easier to make than you think. When it comes to Disney characters, there’s no shortage of creative choices to inspire your baking! 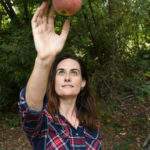 I’ve always loved the look of the Snow White Poison Apple and wanted to share with you how to make an edible version! If you’re not sure what the Poison Apple it’s the apple the Evil Queen gives to Snow White to try and kill her. When the Queen lifts the apple out of her cauldron, the liquid drips off of it and creates a delightfully creepy skull. And then she turns it blood red so it looks appetizing to Snow White. Why Snow White chose the Red Delicious apple instead of the Granny Smith or Pink Lady is beyond us… but she’s also cool with birds crimping her gooseberry pie crust with their feet. We’re bringing takeout the next time she invites us over. 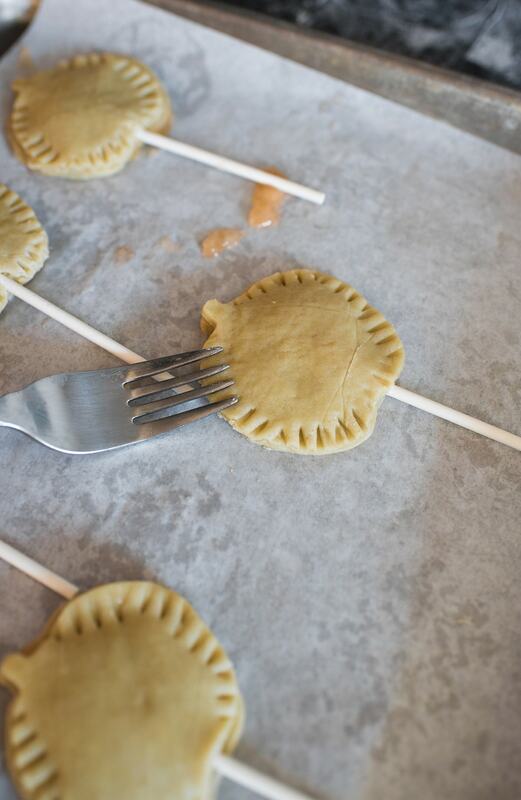 The apple pie pops might look tough, but they’re actually really easy. First, create the cinnamon icing so it has time to set up. In a medium bowl, whisk together powdered sugar, milk, cinnamon, and vanilla extract until it’s a smooth consistency. This icing will create that spooky skull look. Place it in the fridge while you make the pie pops. Next, make a pie filling or use your favorite store-bought one. Then, preheat the oven to 375° F and roll out your pie crust dough (bought or homemade) to at least 1/4″ thick, if not thinner, on a parchment-lined baking sheet. You can probably use a little more filling than this, but not much. Cut out apple shapes with a cookie cutter. Re-roll scraps and keep cutting out apples until you run out of dough. Fill half of the shapes with up to two teaspoons of apple pie filling. 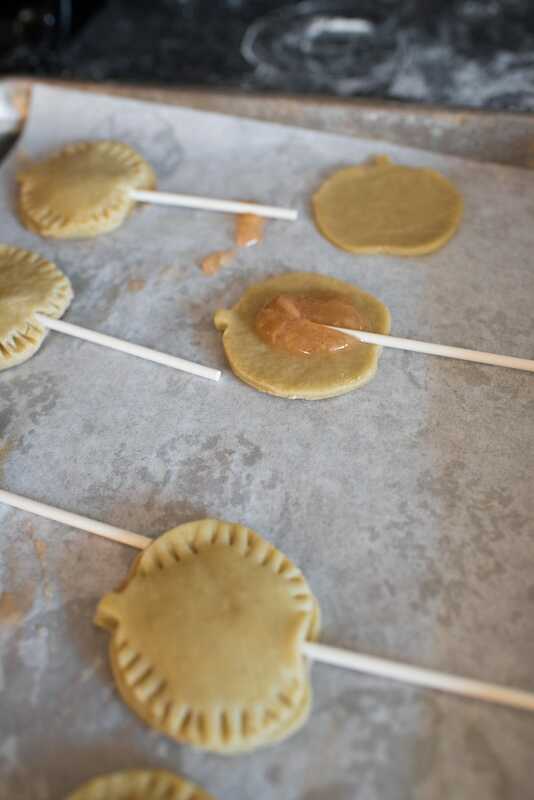 Place a lollipop stick in the middle, top with an unfilled apple shape, crimp the edges with a fork, and brush with egg wash. Bake the apple pie pops for twelve to fifteen minutes or until they’re baked through, then let them cool. Make sure to crimp the edges! Transfer your cinnamon icing to a piping bag fitted with a Wilton #1 or #2 tip and pipe on the skull! Start on one side and trace the outline of the skull and the outline of the eyes. Then, fill it in. If you’ve ever made sugar cookies, it’s a similar concept, except you’re not using the same icing consistency for the border and the flood filling. The thinner you make the dough, the more filling you’ll taste, but don’t go too thin or else it’ll be really hard to work with. Don’t have an apple cookie cutter? I used a combo of the top of a pumpkin cookie cutter and the bottom of a pineapple one to make these. When I made these, I had some leftover pie filling from my Apple Pie Bread, so I used that. You don’t need much, so if you’re making some to create these, you’ll probably want to make a batch and a half so you have enough to make a proper apple pie with. Make sure to crimp near the lollipop stick to help prevent it from falling out. I found this image helpful to keep near me as I was piping the poison apple design. The cinnamon in the icing is optional. Share yours with me by tagging me on Instagram with @letseatcakeblog! I can’t wait to see them. And, check out this rad video on how to make Snow White Poison Apple Cake Pops from Baker Girl Steph! She has tutorials for the raddest treats on her YouTube channel. 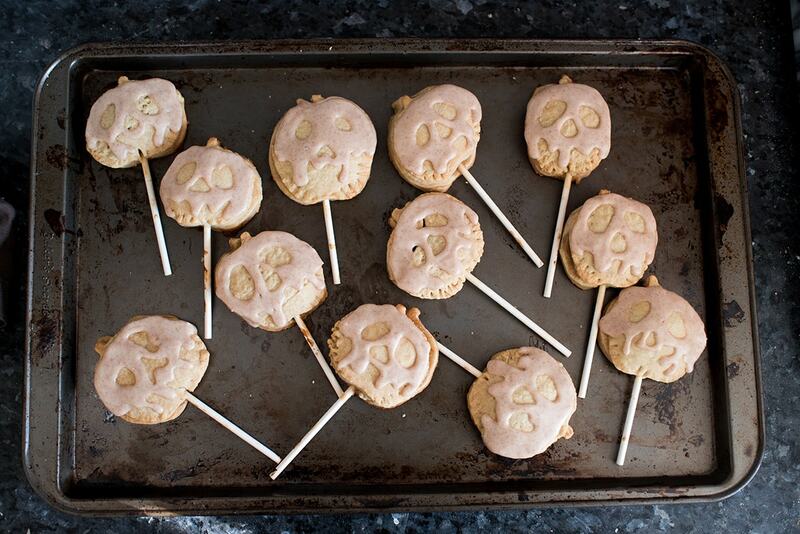 These Snow White Poison Apple Pie Pops are delightfully spooky and perfect for Halloween. Whisk together powdered sugar, milk, cinnamon, and vanilla until fully combined. Place in fridge. Make your favorite apple pie filling. Set aside. Make your favorite pie dough. Roll pie dough to ¼-inch thick, if not thinner, on parchment-lined baking sheet. Cut out apple shapes. Re-roll scraps and continue cutting shapes until out of dough. Place up to 2 teaspoons of filling on half of the shapes. Be careful not to overfill. Place lollipop stick on top of filling. Top filled shapes with unfilled shape. Crimp edges, especially around lollipop stick. Brush each apple shape with beaten egg. Bake for 12-15 minutes or until they're baked through. Remove apple pie pops from oven and let cool. Transfer cinnamon icing to piping bag fitted with Wilton #1 or #2 piping tip. Begin at edge of pie pop and pipe outline of skull, eyes, and nose. Fill in skull design with icing. Let icing set and enjoy! This recipe was inspired by Bakerella's Pie Pops! Talk about adorable! These poison apple pie pops look so fun and delicious! I’ve sent the URL to my niece as I know she will want to make them for their Halloween party! Thank you! They’re really fun to make! How lovely and nostalgic. 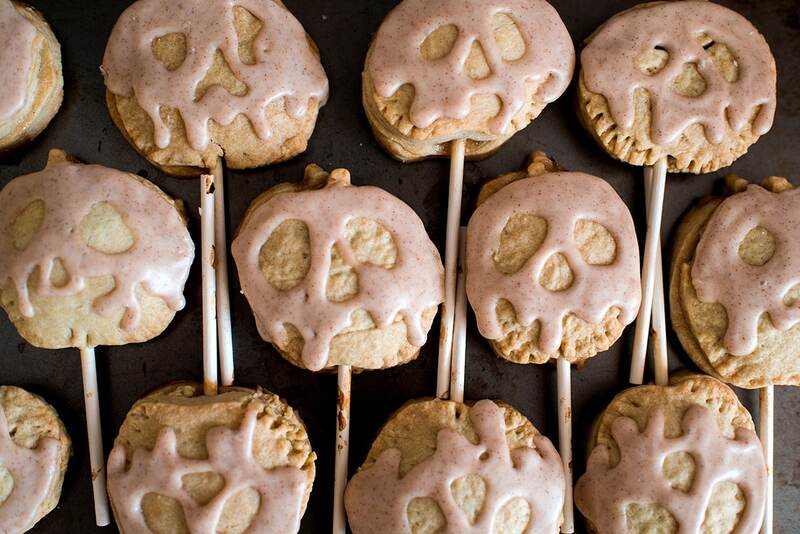 Mini apple pie pops with a ghastly twist. My children will love to instagram these as much as eat them. Great! Thank you! Tag us with @letseatcakeblog so we can see! I LOVE the name you gave these apple pie pops. My daughter is a big fan of snow white and apple pie so this is perfect of her. Can’t wait to try this. This pops are so cute! And the story behind it sounds so entertaining too; perfect for Halloween party snack for the littles. I love pretty much all apple desserts and these are just too adorable!! Great job! These are perfect for Halloween! And I love that they’re actually pie pops. What a fun twist on the typical “poison apple” dishes you see. What an adorable treat!! This will be a surprise the kiddos will love at Halloween. As pie pops I prefer them to candy. This is certainly a fun idea. These are SO much fun! What a great treat for fall! I need to get my 6yo into Disney movies so he can fully appreciate things like this! This little treats are perfect. A uniques and absolutely adorable Halloween dessert for my kids and their friends. These are so fun! Such a clever idea and so well executed! My daughter would love these so much – and they look tasty too, of course.